When your kids are ready to have their own bedrooms, for sure, they are excited to have a well-designed bedroom made according to their likes. 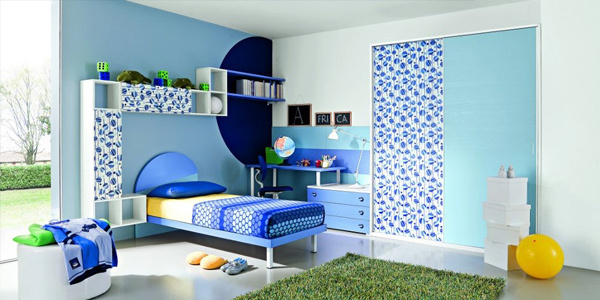 You will also be excited on how you could make your kid happy by decorating his or her bedroom. Of course, the first thing you need to do is ask your kid what he or she really wants. Then you conceptualize on how you will do it. Think of what you already have and what you still need to acquire. Depending on the theme of the bedroom, it could be expensive or affordable. It is up to you to create a budget that will be enough to give your little ones the bedroom of their dreams. But as you design yourkid’s bedroom, bear in mind that as he or she grows up, the design of the room will also be altered. A teenager wouldn’t want to sleep in a childish bedroom. So, for now, here are tips in designing your kid’s bedroom that may help you to please your children. 1. Use bright colored window treatments. Use colorful curtains for your child’s room. See to it that the color you will use will match with the motif of the entire bedroom. Stick with bright colored window treatments for it can give the room a sharper and cleaner look. You can place a valance to lessen light that comes from overhead during the day. Also, place a shade to be used in the evening. Use a shade that has a color that complements to the room. 2. Use child’s toys as decor. Your child’s toys are colorful and they also come in different sizes and shapes. They can serve as a decoration for the room. This way, you can save storage space by using hooks to hang large toys and open shelves for small toys. It actually looks great especially if the toys are arranged well. 3. Use prints and paints. For the wall of the bedroom, choose a bright colored paint and combine it with some prints. Aside from the wall, you can also use it for cabinets and other accents. You can try using a mural instead of prints. Let it show your kid’s favourite theme like flowers, race cars and others. 4. Use fabrics that fit the room. For the beddings, you can use one that match with the theme of the room Select your bedding to match the theme of the room as well as for comfort. Mix and match sheets, pillows and comforters. You can even have some extra pillows just for accent. Aside from that, you can also match your curtains. This can give the room a united look. You can also make the ceiling suitable for a kid’s taste by decorating it with glow in the dark items. They would enjoy staring at it while they are about to sleep. It would seem like they are gazing at the night stars. 6. Place educational things in the room. Do not just stick with the design. Be sure also to place things that could aid for their learning like books, charts and toys for education. This way, your kid can have fun while learning. 7. Use photos for decorating. Make use of pictures of your child’s fondest moment. You can include photos taken while you were in vacation, activities in school, achievement day and many others. You can create an accent wall using these photos which are framed in various sizes. Storage areas are important for a kid’s bedroom in order to keep your kid’s things. Allocate different areas for their toys, books and clothes. Train them to return the things they took. Teach them how to be organized. Since your kids will surely crawl on the floor to play. Place a broadloom to protect your kid’s feet, knees, hands and other parts of his body. Choose a broadloom carpet that can suit to the design of the body. There are many options to use in the floor. You can also use rubber mats in lieu of carpets. To give enough light during the night, place a lampshade. It can also be good as an added decoration for the bedroom. There are decorative lamps with creative shades which you can use for your kid’s bedroom. But you can also buy plain lampshades and decorate it yourself. Some designs are indeed elegant and sophisticated. But whatever decoration you use, one thing is more important, it is the love and care that can be mirrored on how much hard work and time you have spent working on your kid’s room. 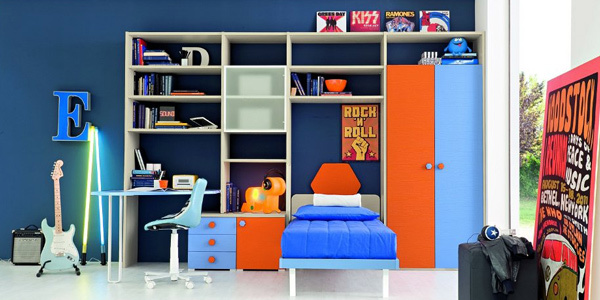 If you want to have more ideas, try to check 20 Vibrant and Lively Children’s Bedroom Designs.